Detail view of a Greek vase painting. It shows Klytaimnestra with the Erinyes. It is from the Louvre in Paris. Klytaimnestra (or Clytemnestra) was a person in Greek mythology. She was the daughter of King Tyndareos of Sparta and his wife Leda. She was married to Agamemnon, King of Mycenae. With him her children were Iphigenia, Elektra, Orestes and Chrysothemis. 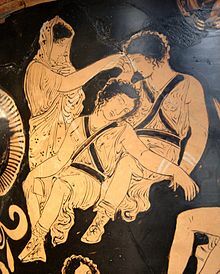 After the Trojan War, Klytaimnestra and her lover Aegisthos killed Agamemnon. Klytaimnestra and Aegisthos are later killed by her son Orestes. This page was last changed on 8 June 2013, at 23:19.